Go for it if you want a decent mid-range phone with big vibrant display and a premium finish. Else, there are better options available for power users. The 2017 version of Samsung Galaxy A7 is a stylish phone that does perform well. The hardware specifications are not top-class though; the A7 stands out as one of the best mid-range phones from Samsung. First off, the design of A7 looks premium and it does offer a slew of reasons to not move past it. But that does not mean it’s a muscular contender in the crowded mid-range smartphone market which is ruled by OnePlus 3T. We all want our phones to be compact in size and sleek in look, easy-fit to our palm all while yearning for a display big enough to watch videos. I didn’t face any performance issue in over a week of using the A7 but one major letdown is its size given that it’s not a pleasing fit for most hands. It’s almost way too fiddly to handle it one-handed. However, the brilliant full-HD display of A7 makes its content look vivid under intense sunlight. The Galaxy A7 features a decent 3600mAh battery and it comes with handy power-saving options.One of the features that make the Galaxy A7 stand out from the competition is its IP68 dust and water resistance rating. This means that the device is protected against foreign objects and ingress of water at up to 1.5 meters for up to 30 minutes. Overall, Galaxy A7 flaunts a trendy look and offers a decent battery life, water and dust resistance, and a vibrant always on display. Let’s dig deep into the details to find more including how it stacks up against the competition. Galaxy A series phone sports a robust metal and curved-glass build and looks much like the Galaxy S7. The device is a little heavier at 186 grams as compared to 172 grams of A7 of 2016. The phone with its 5.7-inch display and 156.8 x 77.6 x 7.9 mm dimensions feel pleasant to hold. The A7 of 2017 got a size bump up to 5.7 from the A7 of 2016 which had a 5.5-inch display. With bezel-less design being the new trend, this phone boasts a thin groove and bezels are slim. The front of the screen shows off the big glass even from a distance. Hence, guarding it against any harm such as a scratch or a drop-off would warrant a little extra protection. This also essentially translates to an enhanced video viewing experience for the regular YouTube viewers. The hardware buttons of the A7 2017 edition stay intact. The headphone jack is at the bottom and the hybrid dual-SIM slot is on top. The speaker is repositioned and is side-mounted above the power button. I found it little odd because every time you watch a video in landscape mode, you end up covering the speaker as you hold the device. The Always On Display (AOD) is a new feature found in Samsung A series smartphones. The feature comes handy to keep up with notifications without unlocking your device time and again. AOD displays date, time, and battery percentage. You can configure it to show two different time zones, change the look and feel, and the content to show on screen. The Galaxy A7 features a 5.7-inch Super AMOLED Full HD display with a 386 ppi pixel density. You’ll find that the colors pop very nicely and that the display has nice viewing angles. ‘Adaptive Display’ mode is enabled by default; you can change it, to optimise the color range, saturation and the sharpness of your display, to ‘AMOLED cinema’ to ‘AMOLED photo’ to ‘Basic’ mode. The display is bright even in broad daylight under direct sunlight. The Galaxy A7 is a package from Samsung which features IP68 certification, micro-SD card support, 32GB of internal storage and a noteworthy 3,600mAh battery. However, with 3GB of RAM and Samsung's mid-range Exynos 7880 SoC, Galaxy A7 is no comparison with OnePlus 3T which has high-end Snapdragon 821 and 6GB RAM. The device is capable enough to handle multiple opened tabs in Chrome and a few app and game windows in the background, without any substantial heating issue. But when I played Asphalt Nitro, I did experience sluggish response and mild heating issue. So if you are not a crazy multitasker or gamer, the A7 will readily serve your needs without any hitch. Fingerprint sensor doesn’t respond many a times when the device screen is turned off and it falters too often than you would expect. My 14-month old Huawei Honor 7 didn’t ever let face such as erratic fingerprint reading. The Galaxy A7 on runs on Samsung's TouchWiz UI running on top of Android 6.0.1 Marshmallow which is little disappointing, but Samsung has started rolling out the Nougat update for the handset. A7 comes with two browsers –Samsung’s own and Google Chrome, multiple photo and music apps. The phone also bundles Microsoft’s applications. So the suite of apps from Microsoft, Samsung and Google make the app ecosystem little clunky and the fact that you can’t install most of these apps is even more exasperating. Software features of the Galaxy A7 include by default the Secure Folder, S Bike Mode, Device maintenance, Blue light filter, and more. There are several advanced features that help automate a lot of tasks. Start stay allows preventing the display backlight from turning off while you are looking at the display. You can set the device to launch the camera by pressing the Home key twice. Smart capture allows you to capture content across multiple screens. Direct call function helps making call by picking up the device near your ear while viewing call, message or contact details. By using palm motions or turning the device screen downwards, you can mute incoming calls or alarms. However, accelerometer and proximity sensors at times seem to be slow. The Samsung Galaxy A7 of 2017 comes with a slightly bigger 3,600mAh battery than that of the king in mid-range segment --the OnePlus 3T, which has a 3,400mAh battery. The battery backup is decent and readily lasts for a day. The device supports fast charging technology such as Samsung’s Adaptive feature or Qualcomm Quick Charge 2.0. You can further extend the battery life using the Medium and Max power saving modes that limit device performance by reducing CPU speed, preventing background data. I found this functionality really helpful. 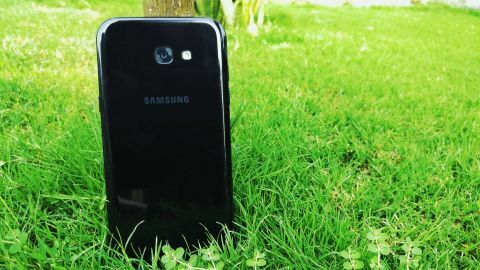 Samsung Galaxy A7 comes with a 16-megapixel camera with an aperture of f/1.9, autofocus and an LED flash on the back and a 16-megapixel f/1.9 camera on the front. For those who want to upgrade from last year’s Galaxy A7, the new A7’s camera performance could make you feel good. In daylight, the camera performs well enough with crisp and vibrant images with certain level of detail. However, images taken in low light aren’t vibrant at all which is little disappointing. The camera offers Panorama, a Pro mode with advanced settings, Hyperlapse, HDR, Night, and Food modes by default, along with Auto. The 16-megapixel front camera of Galaxy A7 is capable of taking lively pictures and will entice to selfie lovers. The A7 is capable of recording Full HD video. The upgraded version of A7 offers you more than one would expect. Overall, this is a stylish phone with a vibrant display and the fact that it offers you dust and water resistance is commendable. However, if you want the best midrange phone, there's no avoiding the OnePlus 3T.